Wow! It’s been months since my last osu update. To be honest, I’ve been slacking since I hit 1k PP. But we all know that can’t settle for that because surely I can do much better. Actually, I think I stop playing osu for a good month because I got my new computer and my osu files kinda broke. Either way I’m still looking to hit 2k before the end of the year, is that too little or too much to ask for? Let’s talk about that. A few months ago when I was climbing to 1k, it was honestly not a challenge at all. All I had to do was play more maps and bam, 10 PP, 20 PP, they flow in like views on a kitty video on Youtube. Now that I hit 1k, I reached a slower point where it really isn’t as easy to gain over 5 PP on a map. In order for me to actually gain a good chunk of PP, I have to perfect a map that is at least 4 stars. So the method here is to not spam a ton of mediocre maps anymore but to get good at more challenging maps. I think playing a variety is still a great way to practice since you don’t want to play a map purely on muscle memory. Also, what I learn about muscle memory though music is if you keep making a mistake at the same part of a song, stop practicing that part and jump to something else before going back to it. Other wise your muscle will be learning how to play this mistake and end up working against you. Applying this to osu, don’t over repeat a song. Move on. In terms of skill wise, I am much better at reading now than I was a few months ago. I don’t have issues with fast hops anymore but I still can’t perfect a stream that’s more than 6 notes. It’s frustrating because it really is hindering my performances in some songs(eg. DJ Genericname’s Dear You). What I think I’m going to do is pick a nice song and make my own stream practice maps. What I can also do is copy certain choke sections of songs I want to perfect and edit it into a custom map. Haha, is that too try hard? Maybe.. But I’m sure it’ll help! Well anyways, I want to keep this update short and concise. I do feel like I’m still improving but the rate of improvement is getting slower and slower. I’m not giving up. Fighting! 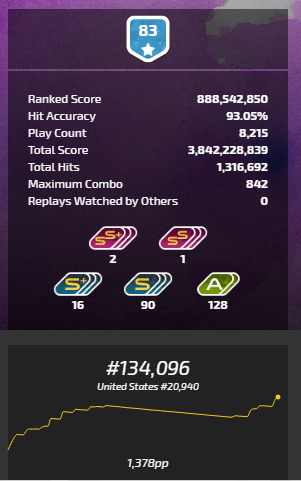 Current Osu PP: 1380 ….1500 would look pretty cool.